I have a thing for embellished clothing. In my opinion, a jeweled sweater adds instant glam to any outfit and there’s also no need for added accessories. I’ve been meaning to jazz up a simple crew neck sweater and so glad to finally share this simple yet stunning DIY jeweled sweater with you. I picked up a super basic yet necessary Joe Fresh merino crew neck sweater ($49) and went to town on it by adding an assortment of sparkly blue crystals to the collar and arrow strips down the sleeves. I am incredibly happy with this DIY Joe Fresh embellished jeweled sweater and can not wait to work on a few more variations! I hope you’ll give it a try and just have fun and go crazy with it! Before you begin, plan out your design. For the arrow strip sleeves, I cut 14 strands of chained rhinestones in total – 7 strands per sleeve. Each sleeve consists of 7 strands of 4 differing lengths, with the center strand being the longest, and each other strand was one rhinestone shorter then the before, creating an arrow pattern. TIP: Be sure to line your sweater with a thin card board, before you proceed! 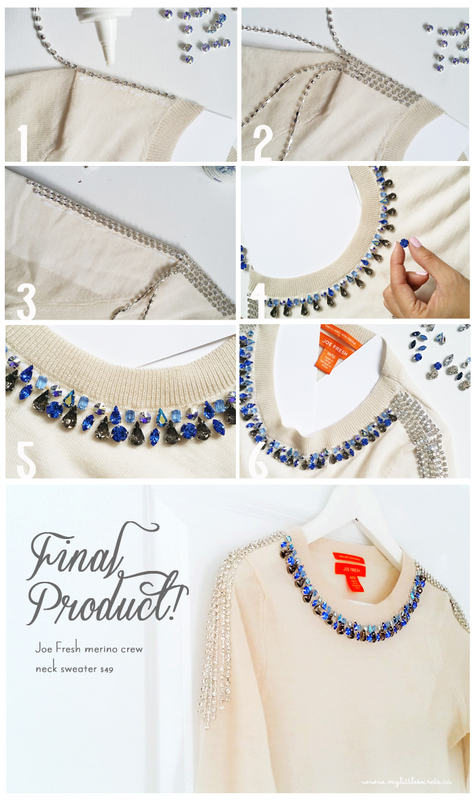 This DIY jeweled sweater does require some patience due to the drying time. If you want stellar results, try to apply as little glue as possible (even though the glue does dry transparent). Be sure to also wait until one section fully dries before you work on the next. I’d also recommend waiting a full 24 hours before wearing your sweater. In terms of caring for this garment, due to the delicate crystal pieces, I’d definitely be hand-washing this bad boy. 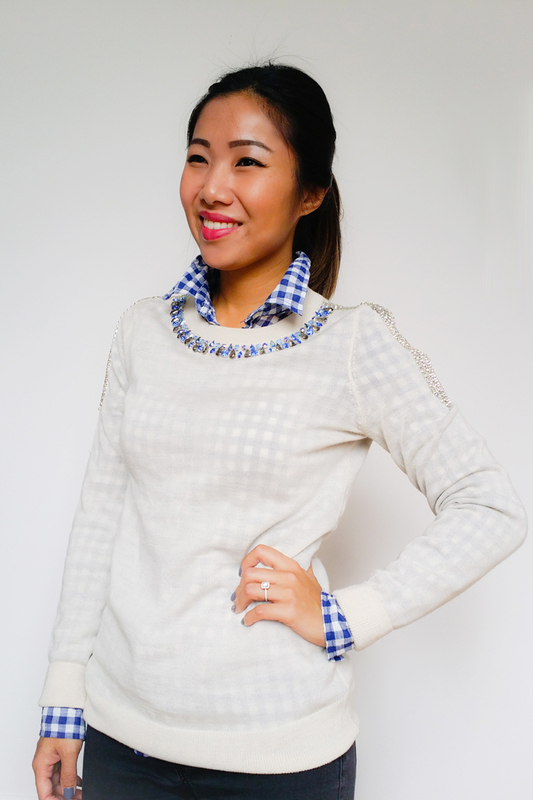 I love layering this sweater on top of a plaid collared shirt in the same color scheme! What do you think? Would you give this DIY a try?? Giveaway :: BENCH Wants to Send you to Whistler! I Love this tutorial! Thank you so much! I have some old sweaters that need jazzing up and I love that design you created! Super talented! I love this! I can’t wait to try it. Hi Genelle! Thanks for your note! I actually got the plaid button up at Joe Fresh as well!!! Thank you so much Adena, I love bejewels too!